Bijou - A gem of a little salon in Skaneateles: Bijou is a salon of distinction and Stacey is a Betty! Bijou is a salon of distinction and Stacey is a Betty! Tonight was surreal...First we had a very successful party for Baremineral, educated lots and lots of people about mineral make up, we did lots of "make-unders" and had so many laughs, actually side splitting laughs! So in the middle of it, I get a phone call, it was someone with very bad laryngitis, I had a hard time understanding the person, I heard..."Stacey..in the salon....pictures"...so I said, "Oh yeah..." because I take pictures of people in the salon all the time for the blog. So in my head I'm running over all the Stacey's over the past couple of days..Then I hear...."Magazine....Salon of Distinction.....contest you entered"...At that point I stopped my brain and focused on the words she was trying to say...I think I must have had her repeat it quite a few times, I mean before I started screaming, I wanted to be sure..(I'm sure I've embarrassed myself at least once or twice in life, celebrating prematurely) So finally I realized...Bijou placed in the Salon of the year contest! 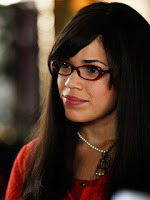 I love to watch Ugly Betty, the tv show, I always wondered if editor in chiefs were more like Willemena or like Betty? I have mostly assumed them to be like Willy, but not Salon Today's Editor in Chief, here I am little tiny salon in Skaneateles, I write her once and she writes me back, not just once, but several times. Then when our salon placed, she calls...me..at the salon...yep, I already pinched myself, it really did happen! Stacey is a Betty...There should be more people like her! Thank you again Stacey! I wanted to call you personally to tell you about your SALONS OF THE YEAR win since we corresponded so much earlier this year, but as you can tell I have complete laryngitis today. I'll have to call you again soon so you can hear my real voice! BTW, we did end up having quite a healthy number of entries, well over 100 of whom met qualifications. 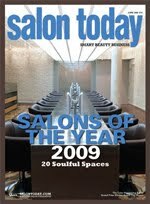 The magazine will feature the SOTY, the three runners up and 16 Salons of Distinction, one of which is Bijou. All the judges were impressed with the inspiring boutique you've created -- as you state it's a gem of a salon. Although I let my associate editor make most of the calls today, I wanted to call you personally. Sorry again it was so hard to hear me!! !